Nicole's Yankees Blog: New Pitching Coach? Since Jackie enjoys my colors so much, I think I will keep changing them! Or at least until I get sick from them. Not much to report now. To answer Joann Pavone, I will mostly be updating my fellow Yankee fans on what is taking place during the off-season. I planned on talking about the Yankees American League Divisional win and the eventual World Series win, but I guess I'll have to wait until next year. Ok I have a question for you, is anyone actually watching the playoffs now? I feel if the Yankees or Red Sox are not in the playoffs, it's not worth watching. But I did notice that the Chicago White Sox won the American League, almost sweeping Los Angeles. Do you think the Yankees could have beaten the White Sox? As for the National League, I know that Houston was leading the series 3 games to 1, but I believe St. Louis may win tonight, making the series tighter. I am still rooting for Houston. Who is everyone else rooting for? The most interesting Yankee news to date is that Mel Stottlemyre, 11 year pitching coach for the Yanks, will be stepping down and the Yankees would like to hire Atlanta Braves pitching coach Leo Mazzone to replace him. I agree with pinstripes that George Steinbrenner had something to do with his leaving. I think there will be plenty more changes to come as well in the near future. Brian Cashman, GM of the Yanks, has his contract up on Halloween of this year, and is rumored that he will leave as well. Along with Cashman, Joanne is correct in saying that Bernie Williams, long time center fielder for the Yanks, may be out of the door. I personally think he should retire, as he would end his career on a high note, and he is getting older and inevitably weaker and slower. That does not take away from his career of a great player though! As pinstripes stated, many ex Yankee pitchers are still in the playoff hunt. I think many players cannot handle the pressure that playing in New York has on a person. The Yankees are known as one of the greatest teams in the world, and they are expected to win every season (especially with the payroll that they have) I still think Contreras was not that impressive, but El Duque could have probably stuck around and performed for a while. Clemens was not supposed to be playing again, but he wanted to be back home in Houston. I will leave with a cheer for Houston! I have a ways to make money site. It pretty much covers ways to make money related stuff. I'm not a Yankee fan, but the World Series is not the same without an east coast team in the mix. I root for the Braves, who obviously were beat badly by the Astros, so I am going to stick with the national league to bring home the championship. I saw today that Leo Mazzone signed a 3 year deal with the Orioles (what is he thinking) so that puts you and I both out of luck. He is the Zen of pitching coaches, teaching perhaps some of the best pitchers of this generation (i.e. Glavine, Maddux, and Smoltz). I share your feelings toward Bernie Williams. I think it is time for him to bow out gracefully and celebrate his hall of fame caliber career. He was great for so many years that now would be a good time for him to hang'em up. Maybe next year we will get to see New York and Atlanta in the world series. It made me sad to read that Bernie Williams might be leaving the Yankees. It is true that he is getting older and slower but he is a great player and wonderful person. Did you know that he is a musician as well. I have his CD entitled “The Journey Within” and it’s great. The songs are mostly soft Latin jazz, a few with vocals (but Bernie doesn't sing). Bernie plays the acoustic and electric guitar. The most heartfelt track on this CD is "Para Don Berna," an elegy to Williams' father who passed away. Check it out if you have time! Now, we have a good idea of what this outfielder will do when he quits his day job. In response to your question, yes I have been watching the playoffs and I am watching the World Series, however, I will admit that my interest level is at an all-time low. NY vs. Boston makes for great post-season baseball, and to not see either of those teams in the League Championship Series or World Series, it leaves me with a feeling of "who cares" who wins the World Series. Usually I'll root for a team, even if it's not the Phillies, but this year I don't have a preference as to who wins it all. I want to root for Houston to see Roger Clemens win a World Series ring in his home town; however Houston is the team that got in the way of the Phillies making the playoffs. Therefore, I have mixed feelings towards them. Anyway, with Mazzone going to the Orioles, it will be interesting to see who Steinbrenner will hire as the Yanks' new pitching coach. I look forward to checking back in and seeing who gets the nod. I'm really enjoying your use of colors and how you've been changing it up every week. As far as watching the playoffs goes, I have to admit that I haven't been too into it. The only games that really interest me are those that include the Yankees, or include the Red Sox losing. I don't think its fair to question whether or not the Yankee's could have beaten the White Sox. The Yanks lost and the Sox won fair and square and they deserve some credit. It will be sad to see Mel Stottlemyre go. He was with the Yankees for so long that I think we all became quite attached to him. I agree with you that he should end his career on a high note. I think Larry Bowa would be a good addition if they should choose to bring him on. I have to be honest, without the Yanks deep in the postseason this year, the playoffs do seem meaningless. 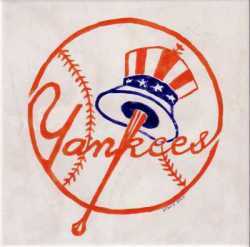 Call us Yankee fans spoiled but seriously, everyone enjoys watching the yanks in the playoffs, love 'em or hate 'em. They definitely make baseball more exciting. I think the upsetting thing to see with them not going further is that Bernie had to go out like that. He deserved to go out on top, but if he leaves now, which is expected I still feel that his legacy will remain that of a winner, and I can definitely see him heading to the Hall of Fame. Maybe his music career can take off now.